The braai is a big part of what makes South Africa great and SA’s greatest boerewors is Kameelhout® (802273). It was developed in the 1990s and the recipe has been refined to perfection. 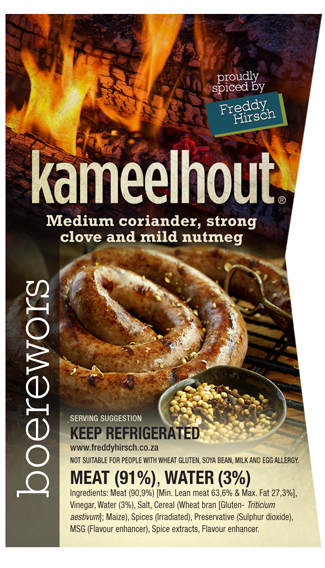 Kameelhout® contains all the necessary flavour components for a great boerewors — in the perfect ratio. This classic boerewors is made with top notes of strong clove, medium coriander and mild nutmeg. These are flavours that the market knows and loves. Because the flavour profile has been so carefully selected and is competitively priced, Kameelhout® appeals to everyone. Designed with the perfect braai in mind, Kameelhout® is also ideal for any occasion when the fire is lit. It tastes especially delicious while watching your favourite team in action. Pair it with a great beer, wine or any of your favourite beverages! The ultimate way to enjoy Kameelhout® is the ultimate Kameelhout® Boerewors roll. You can find that recipe right here. Kameelhout® is available at your nearest Freddy Hirsch Cash & Carry. If you’re a Freddy Hirsch account holder, you can direct any questions and orders to your rep. Each Kameelhout® order comes with attractive, attention-grabbing labels, making the product easy to spot in store.